You are here: Home » 1977 » Chinois, Encore Un Effort Pour Etre Révolutionnaires ! René Viénet, born in 1944, is a French sinologist who is famous as a situationist writer and filmmaker. Viénet used the situationist technique of détournement — the diversion of already existing cultural elements to new subversive purposes. After completing his studies in Sinology in Paris, he moved to China but he was expelled in 1966 for his critical approach towards the Maoist regime. 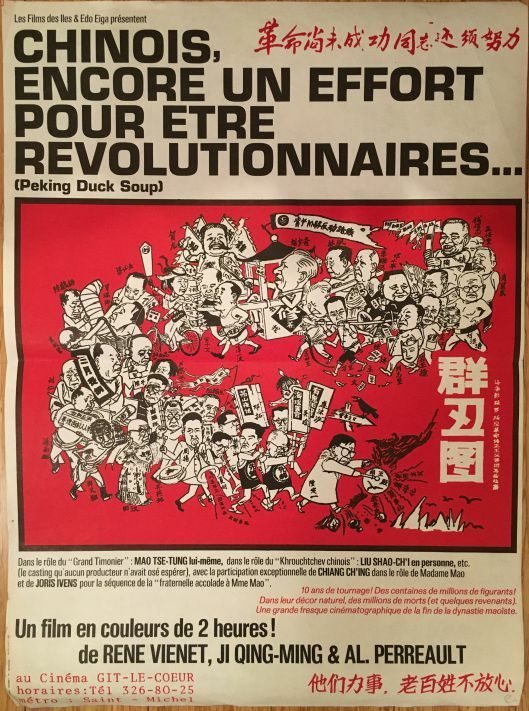 In the 1970s, he worked at CNRS from where he was fired on two different occasions in 1971 and 1978 for violently attacking those who defended Mao, particularly through the books from the publishing house Champ libre where he directed the series Bibliothèque asiatique. From 1974 to 1978, he also taught Chinese at the École polytechnique.